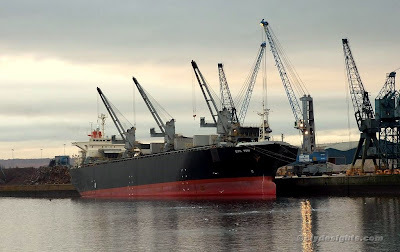 Discharging animal feed at Shieldhall today was the Philippino-flagged woodchip/bulk carrier GYN YOH, a ship of a type seen fairly often on the upper reaches of the Clyde. She was built in 1988 by the Oshima Shipbuilding Co in Japan, and has an overall length of 199.2 metres. Her deadweight is some 43,117 tonnes, and she is owned by a company based in Panama, with Singapore based managers.